Well, we are in the water. That is a start. 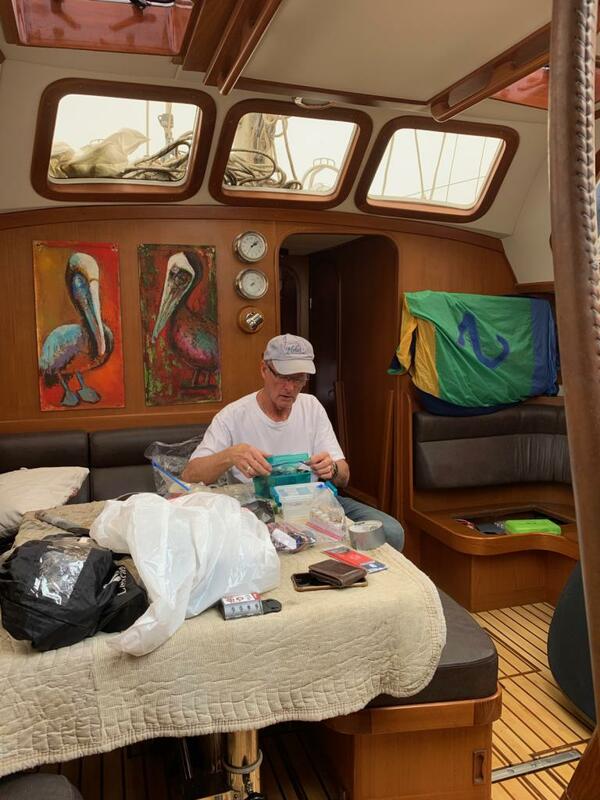 In addition to the work that we had planned to do on the boat, we have had some new surprises that have caused some major headaches. 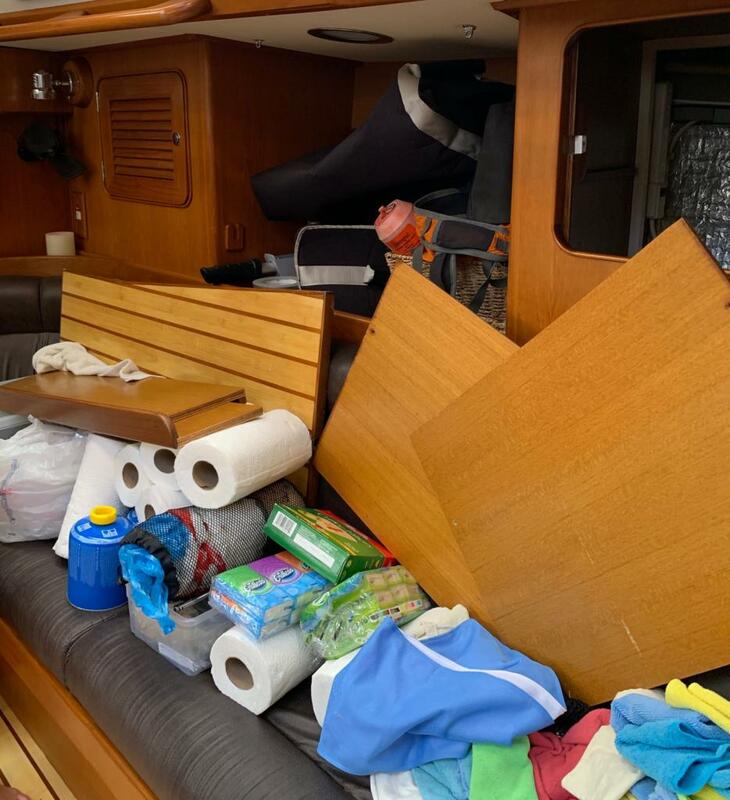 When the stanchions were removed to paint the deck, they weren't re-bedded properly causing the rain from the wettest winter in Marmaris to intrude into the boat and all over anything inside cabinets from clothes (wet and mildewed) to electronics (no damage there). Rain also came in through the forward window frames which had been painted but not recaulked yet and dripped on and fried our television. Unfortunately, anything electronic in most of the world is 240v, but our US boat is wired for 110v. So, finding a television that accepts dual voltage so we could plug it in to our 110v system proved challenging. We succeeded, however, so at least we can still watch Seinfeld when we need a laugh. However, there has been no place to sit to watch the new tv since EVERYTHING in our cabinets was pulled out so they could access the bolts under the deck when rebedding the stanchions. First world problems - I know. The good news is that the stanchions have been rebedded, Charles and I successfully rebedded two leaking hatches, the new arch is installed, beautiful and functional, the cabin floors have been refinished, and the new watermaker is installed and functioning. The painters are still finishing up the work on the new non-skid paint topsides and all the caulking around the toe rails and windows. The new canvas and cushions are complete and ready to be installed. The riggers were set to tune the rig today, but found some issues that will require ordering new parts...so another delay. After the rig is tuned, the sails will go back on. I'm guessing we'll be here at least until the end of the week. The restaurant at the marina is very good, and we are sleeping in our own bed now and no water comes in when it rains, so it could be worse. We are currently waiting to find out from the marina when "splash day" is. It was supposed to be today, but we are surrounded by boats in the marina which are hemming us in. It looks like we'll launch on Wednesday, but there is still work to be done on the boat - and on the boats surrounding us! We're currently waiting for the carpenter to show up to put a final coat of varnish on the cabin soles below decks. The painter still has work to do to finish the new non-skid paint on the deck. The welder still is coming to do final touches and tweaking to the new arch which has been installed. And, all of our new canvas is arriving and being fitted when we finally get back in the water. When we get back in the water, we'll also test the new watermaker which has been installed. In the meantime, we just wait - not Charles' strong suit. And take the bus for about 60¢ a person into Marmaris to eat, go to the hardware store, go to the market, and just explore. The plan is to depart from Turkey April 18 and re-enter the EU in Greece. Then we start our big trip back across the Med so we can get to Spain by July when we'll return to Park City. Whew. 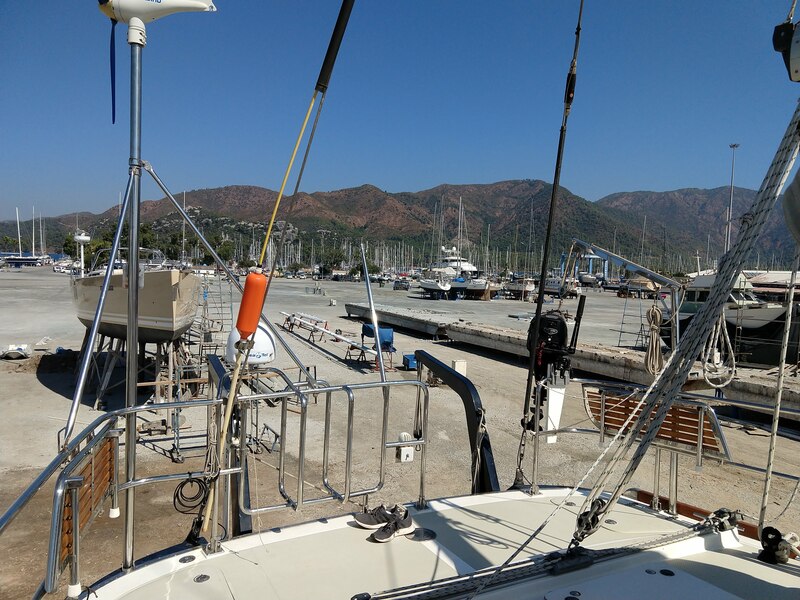 Agua Dulce is out of the water and getting a big makeover at Marmaris Yacht Marina in Turkey as we speak. Looking forward to seeing her new look in April...stay tuned! 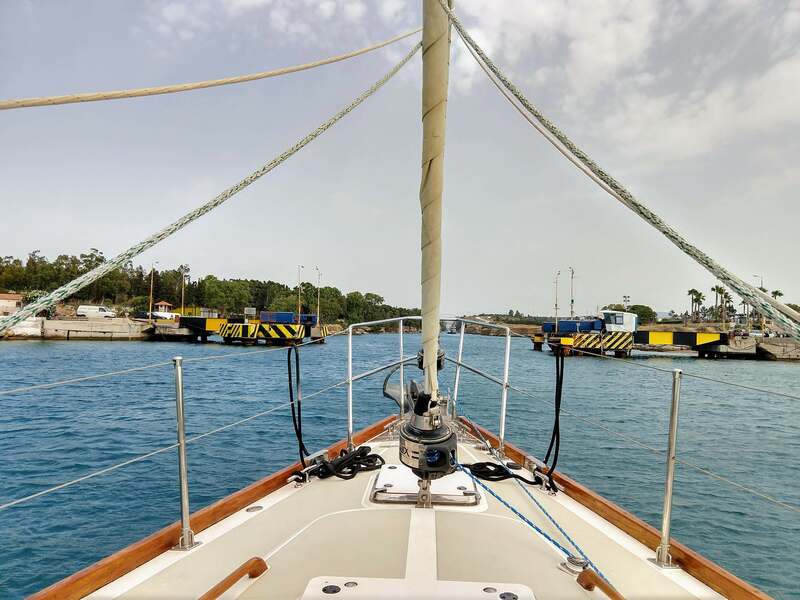 We transited the Corinth Canal in June of 2018 in order to save 430 nautical miles around the Peloponnesian peninsula to get from Preveza to the Cyclades. It was interesting traveling through the canal, and expensive. For our roughly 4 mile, 30 minute passage, the cost was 340 Euros. Wow. And I thought Dallas toll roads had gotten expensive. Rulers from as early as the 7th century BC considered cutting a canal through the isthmus, but it proved to be simpler and cheaper to build an overland portage road, where ships were towed from one side of the isthmus to the other. The emperor Nero was the first to attempt construction in 67 AD, but the project was abandoned when he died. The idea of a canal was revived in 1830, but it was not completed until 1893. Its 300 foot high limestone walls are steep and subject to landslides. Even now, it is often closed for maintenance to clear it out after a landslide has occurred. Interestingly, it has submersible bridges at each end of the canal. 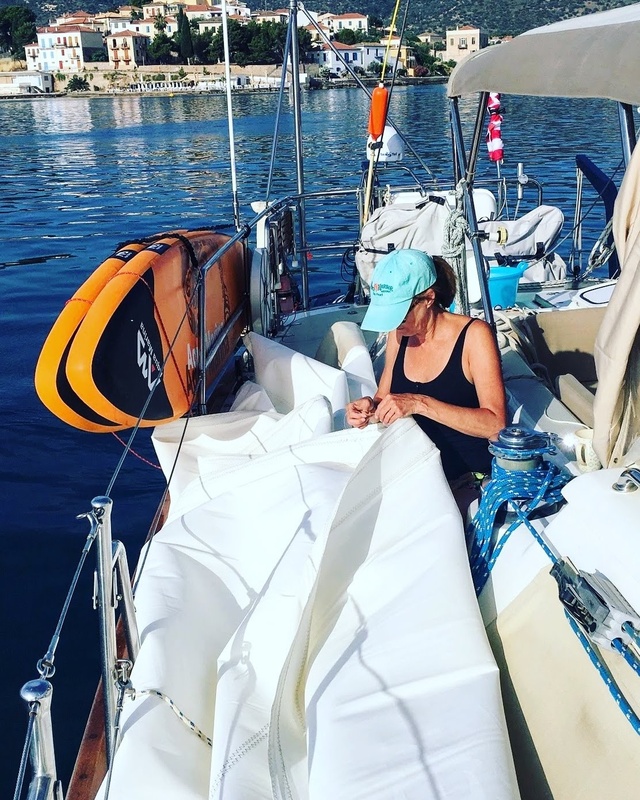 This is sort of a test blog post, so I thought I'd just mention one of the best things about sailing - the reflection of the sun on the water either rising or setting. I have hundreds of pictures of sunrises and sunsets, because I always think that this one is the prettiest one I've ever seen. When you're out on the water, you just can't beat the views. About: Charles is a retired lawyer from Dallas who started sailing Sunfish in Corpus Christi, TX when he was a boy. I'm Gretchen, and I was a stay-at-home mom who doesn't stay at home much anymore. I fell in love with sailing on our first bare boat adventure in the Caribbean 30 years ago. Extra: Special thanks Peter Pan for inspiring generations to stay young and keep searching for their own Neverland.